More people have argued over this dog's breed than any other photo in my collection. Some people feel strongly that he is a Boxer, other people feel equally strongly that he is a Pit Bull. And still others think he's a Great Dane. I can't make up my mind either, but I like the look of him; he looks smart and I bet he didn't like to take orders from anyone. That got me thinking and wondering how he had been persuaded to pull the boy's cart. So I took a closer look and found, much to my surprise (I've had this photo for a very long time, you'd think I would have noticed before now) that he's not pulling the cart at all, just standing near by! No one ever noticed that before. 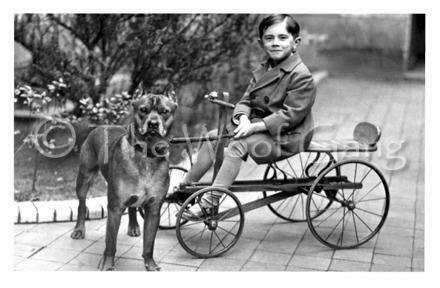 The child is almost secondary in the photo, your eye is drawn to the dog long before you look at the boy. Be that as it may, I doubt that neither the dog nor the child had to wonder where their next meal was coming from. 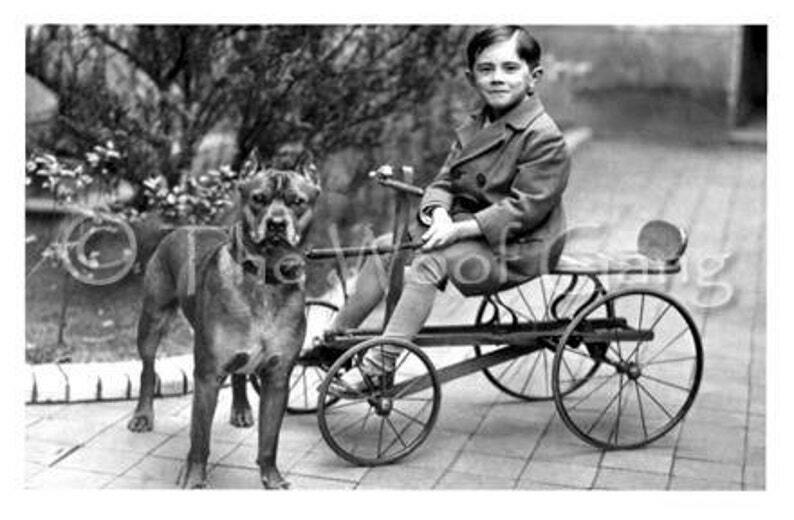 Based upon the boy's clothing and the boy-powered ride, I think the family must have been well-to-do. The photo was taken in Germany and I date it to the 1920's. The watermark will not be on the card when you receive it. It is placed on the photo note cards online in an attempt to keep people from stealing the image. Please note that you are purchasing a photo note card, not an original photo. This photo was professionally restored then printed (not digitally scanned) onto quality card stock and is also available as a print.